When E3light met with design-people, the startup’s painpoint were poor sales figures of the newly launched Mylight – a multi purpose LED strip activated by sensors. What benefits and specific applications might the Mylight LED strip have – and for whom? And how do we persuade people to buy it? The answers weren’t obvious, yet the success of the product depended on defining the target customers and developing a convincing benefit story. The buying power of women is rising globally and their part in the decision making for smart home products is crucial. Therefor we proposed E3light to target female customers as a benchmark for the updated customer experience. Our team explored the entire customer journey – from purchase and unpacking, to installation and use – from herperspective. In dialogue with prospective female buyers and users, we developed new use scenarios along with attractive benefit stories. ”Bedlight” – the winning concept, introduces a scenario of comforting a child in the middle of the night. 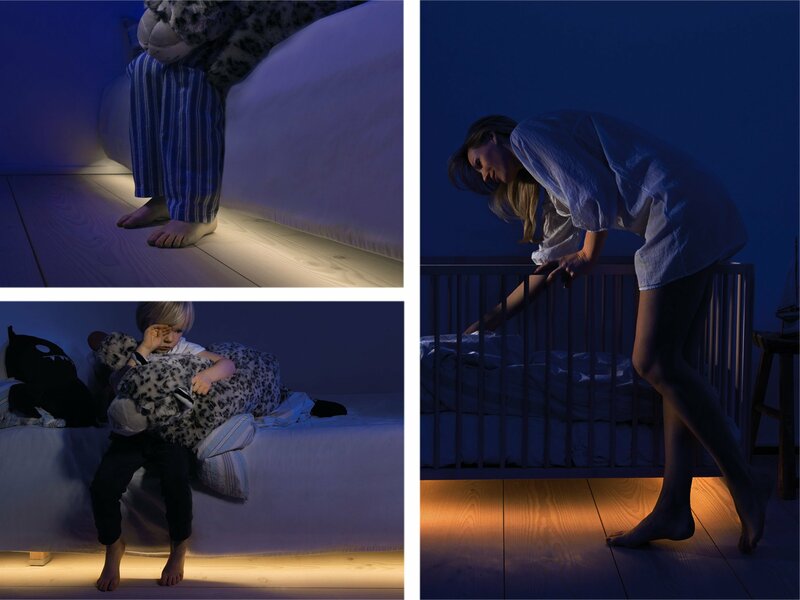 When getting up at night, the Mylight’s muted light will illuminate the floor as soon as you swing your legs out of bed, guiding your path and creating a calm and soothing atmosphere to console the child. The identified scenarios helped us design a packaging and communication concept, which women (and men) could immediately relate to their own needs. The Mylight packaging solution focused on easy installation and a satisfying first time use. Since the Mylight relaunch, especially US sales have taken off. In fact, they’ve been so good that the Danish Trade Council awarded E3light the Vitus Export Prize.